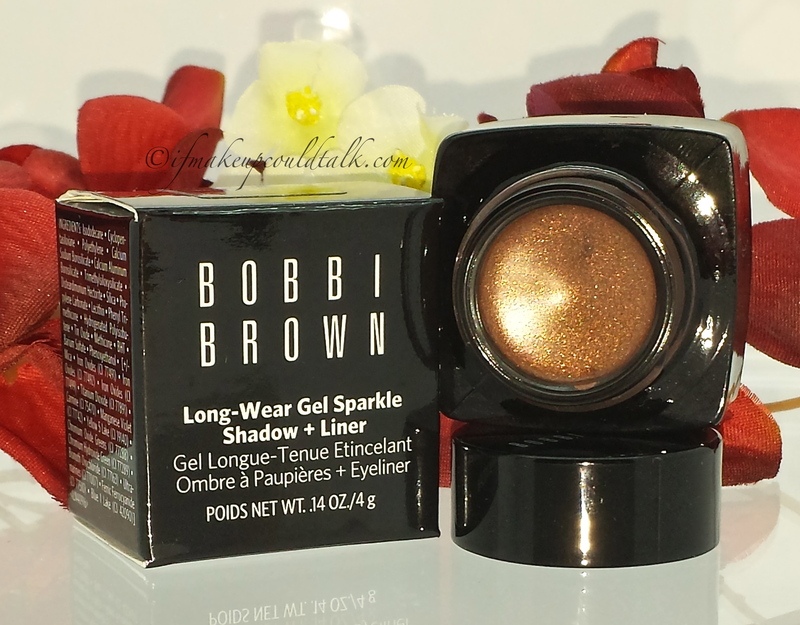 Bobbi Brown 4 Sunlit Bronze Long-Wear Gel Sparkle Shadow + Liner review. 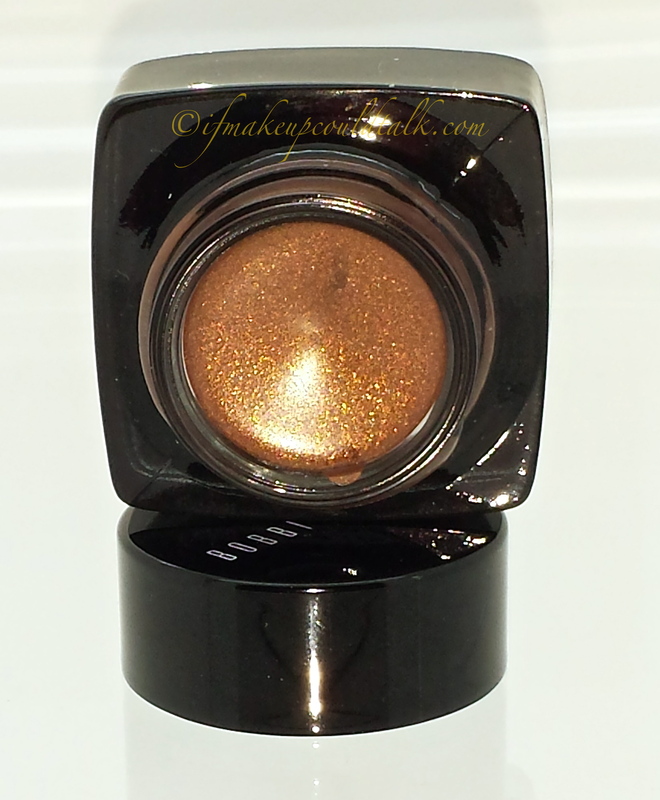 Bobbi Brown 4 Sunlit Bronze Long-Wear Gel Sparkle Shadow + Liner. Shadow and liner get together to deliver definition and drama — a multidimensional eye with rich color and buildable sparkle. Smudge, smoke, line or define for long-wearing, standout eyes in five eye-catching shades: Night Sky, Thunderstorm, Sunlit Bronze, Smokey Topaz and Midnight Forest. If you want a bold multidimensional eye look that won’t budge, look no further. The Pros to Bobbi Brown 4 Sunlit Bronze Long-Wear Gel Sparkle Shadow + Liner. Gorgeous sheer brown color infused with copper and gold shimmers. Despite the abundance of sparkles, the formula does not feel gritty to the touch. 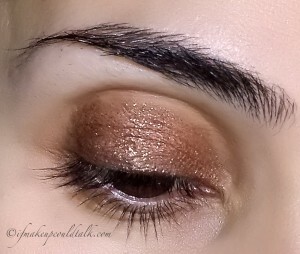 Very sheer texture for those who prefer a minimal eye look. Some may be able to use this as a topper shade. Formulated without mineral oil and parabens. 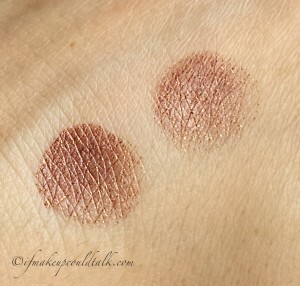 The Cons to Bobbi Brown 4 Sunlit Bronze Long-Wear Gel Sparkle Shadow + Liner. The brown sheer base color coupled with the high sparkle content yields uneven and muddy looking results. Multiple layers are required to achieve opacity. Felt heavy on the lids after the third layer. Sparkles do not adhere well to the skin; sparkles easily migrate and fallout is inevitable. Does not mix well with other cream shadows. Small opening is a bit of a hinderance for finger application. Too sheer to be used as an eyeliner. Bobbi Brown 4 Sunlit Bronze Long-Wear Gel Sparkle Shadow + Liner with primer and without primer (no flash). As you can tell by the photos above, Sunlit Bronze is not the “bold” color I was anticipating. The color did improve slightly over a primer, however not even my beloved Nars Eyeshadow Primer could keep these sparkles in their proper place. 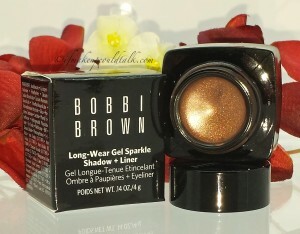 Waering Bobbi Brown 4 Sunlit Bronze Long-Wear Gel Sparkle Shadow + Liner. The above photo shows Sunlit Bronze after the application of three layers. In all fairness, I prefer my cream shadows to be pigmented with minimal layers required. 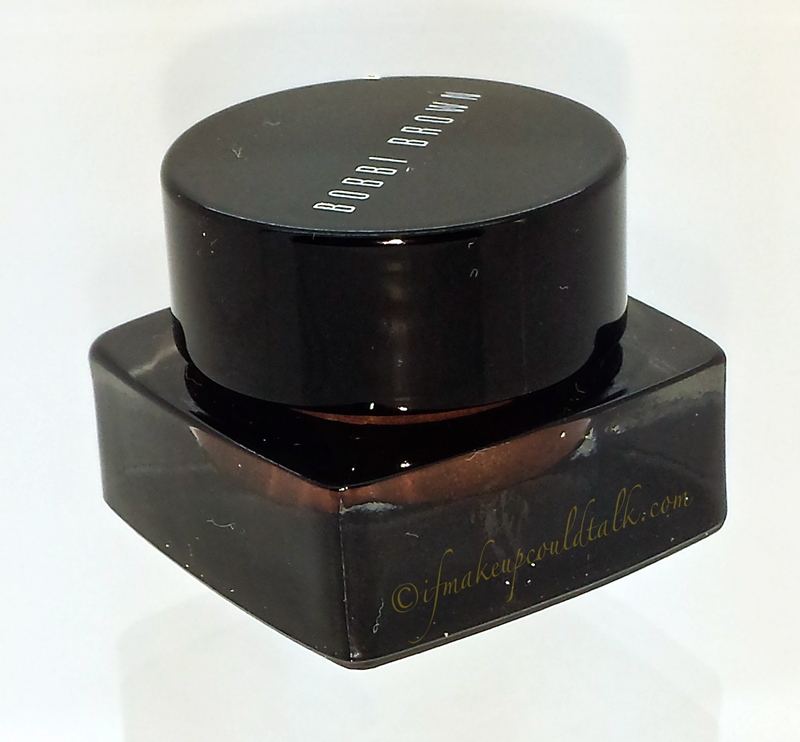 This current Bobbi Brown offering looked muddy and created ridges on my lids were none existed beforehand. The overall effect appeared patchy and felt uncomfortable. 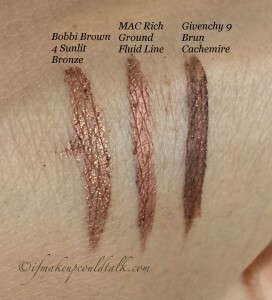 Bobbi Brown 4 Sunlit Bronze, MAC Rich Ground Fluid Line, and Givenchy 9 Brun Cachemire. All swatches were applied with my Meme Angled Eyeliner Brush. Bobbi Brown 4 Sunlit Bronze’s (two passes) sheer base combined with the abundance of sparkles yielded uneven results. Classifying this product as an eyeliner is a rather colossal stretch on the company’s part. MAC Rich Ground Fluid Line (one pass) is a gorgeous pigmented copper brown. The smoother than silk formula is long-lasting and can be used as an eyeliner, eyeshadow base, and stand alone eyeshadow. Givenchy 9 Brun Cachemire (one pass) is a dark warm espresso brown with golden shimmers lightly scattered throughout the color. This smooth, long-lasting cream shadow can also be used as an eyeliner, eyeshadow base and eyeshadow. Best of all, these shimmers are refined and contained. Bobbi Brown 4 Sunlit Bronze fallout after being lightly brushed with a tissue. The above photo demonstrates how easily the sparkles were disturbed with the mere passing of a tissue. Some may be able to use Sunlit Bronze as a topper shade, however, do be aware these sparkles will eventually migrate throughout the day. As you can imagine, the only logical place for these sparkles to settle would be on the face. Personally, sparkles on my face is an absolute deal breaker. 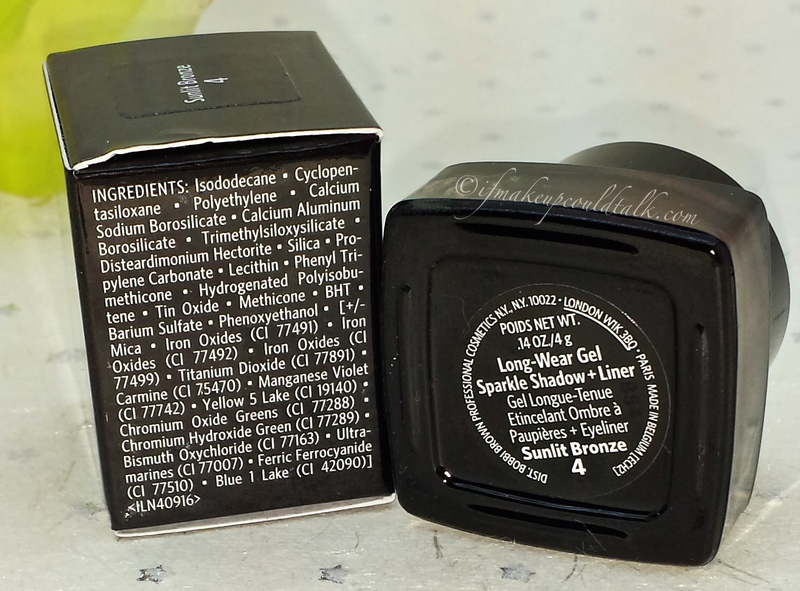 Bobbi Brown 4 Sunlit Bronze Long-Wear Gel Sparkle Shadow + Liner ingredient list. Bobbi Brown Cosmetics can be found at Nordstrom, Macy’s, Sephora, and bobbibrowncosmetics.com. Makeup would tell you the obvious, Bobbi Brown 4 Sunlit Bronze Long-Wear Gel Sparkle Shadow + Liner does not fit the quality I have come to expect from the Bobbi Brown brand. 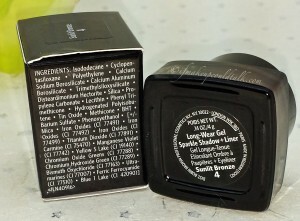 This gel/shadow hybrid is not the most balanced formula to have been created. Considering how much I adore BB’s other gel liners and shadows, the patchy results and sparkle fallout were an unexpected surprise. If you seek a sophisticated sparkle shadow, there are plenty of other quality choices on the market. My personal favorites are Giorgio Armani Eye and Brow Maestro colors; now that brand knows how to get it done 🙂 Until next time, be well, stay safe and be happy.